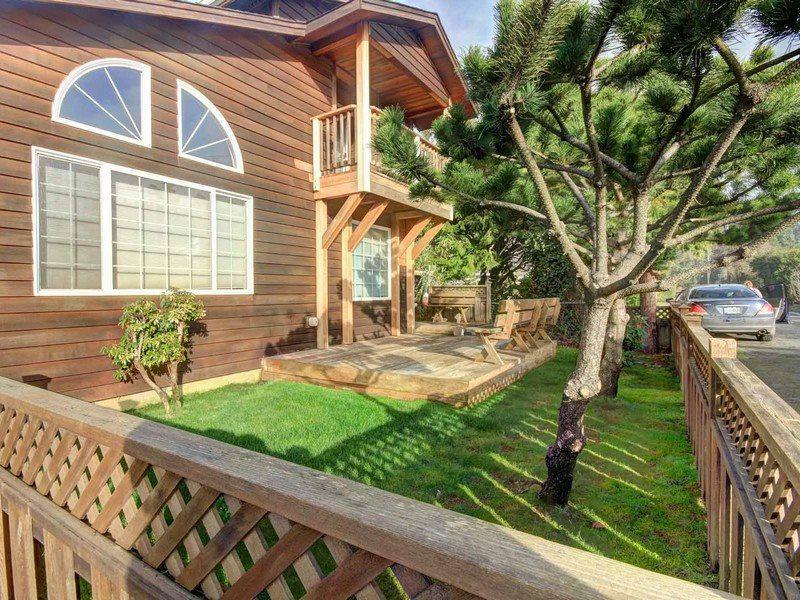 Why hang around indoors all day when this three-bedroom, two-bathroom coastal home offers such a generous assortment of fine outdoor living spaces? 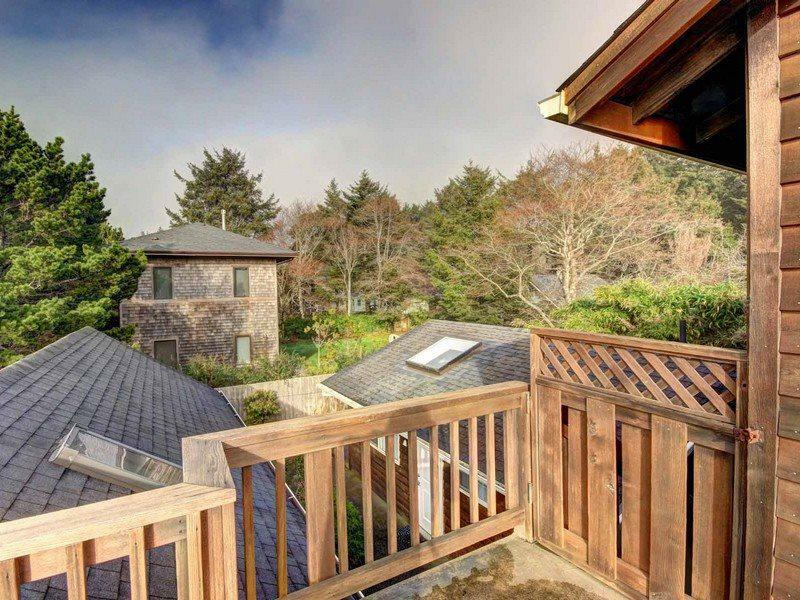 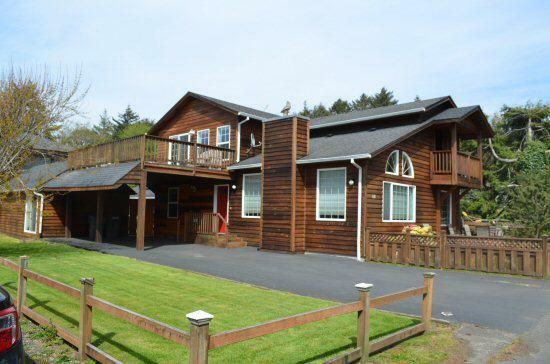 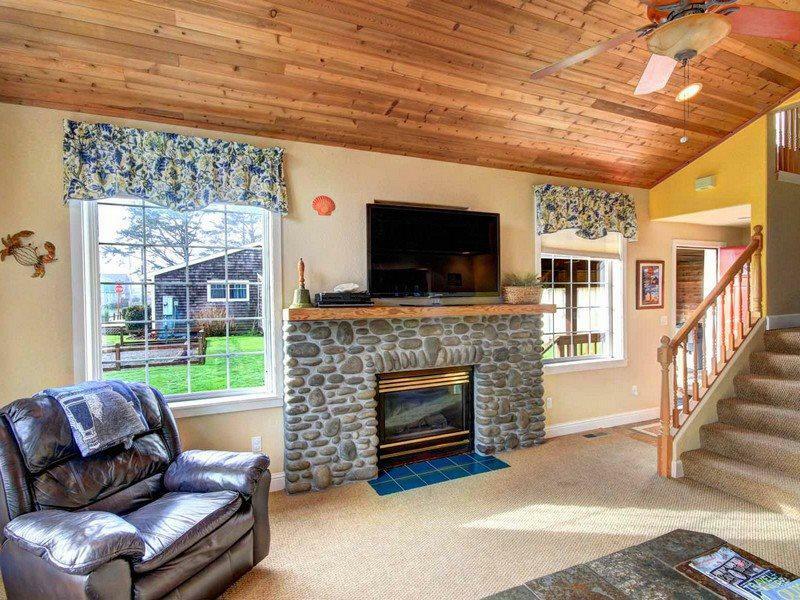 Triple Deck is a family friendly house on a quiet street in Cannon Beach's coveted Presidential neighborhood, but its prize asset is definitely its three fantastic decks, each boasting uniquely stellar views. 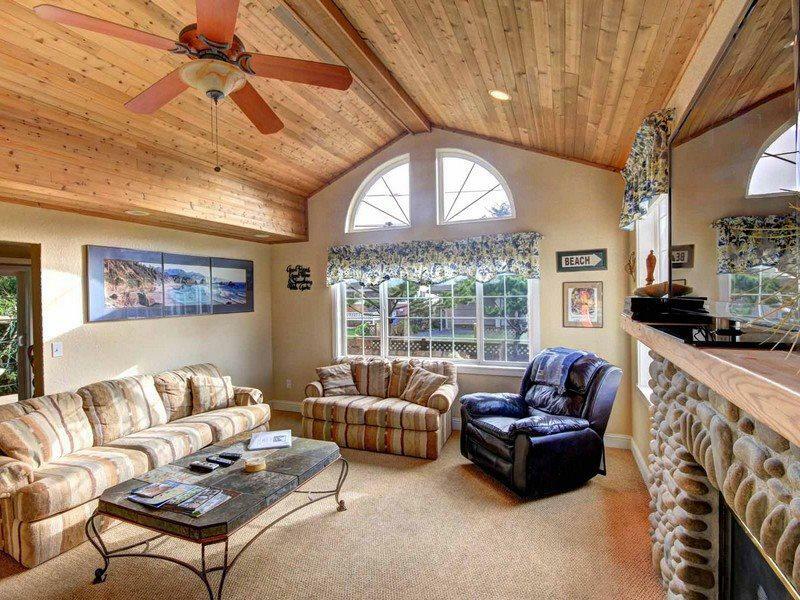 Park your car in the covered carport and enter into a spacious, high-ceiling living room with electric fireplace and flat-screen TV. 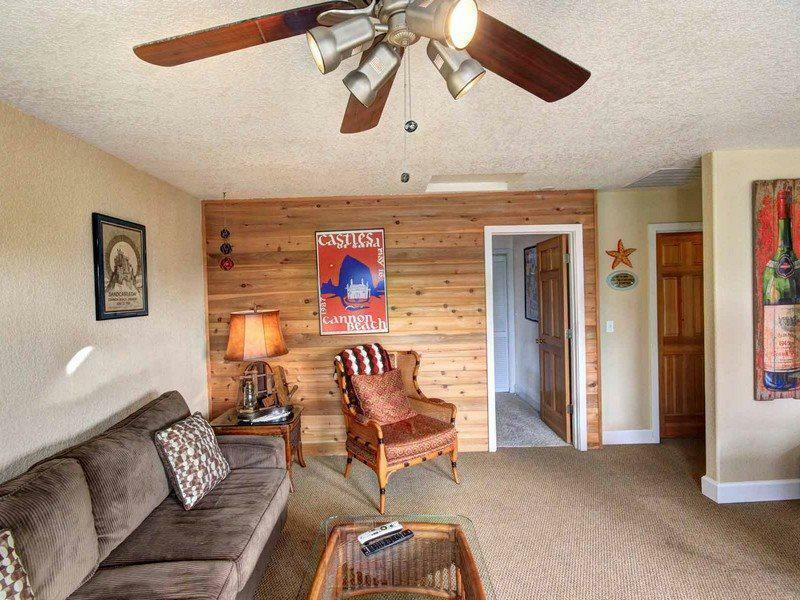 Twin recliner chairs and a pair of overstuffed sofas beckon the weary traveler to settle in and stay awhile. 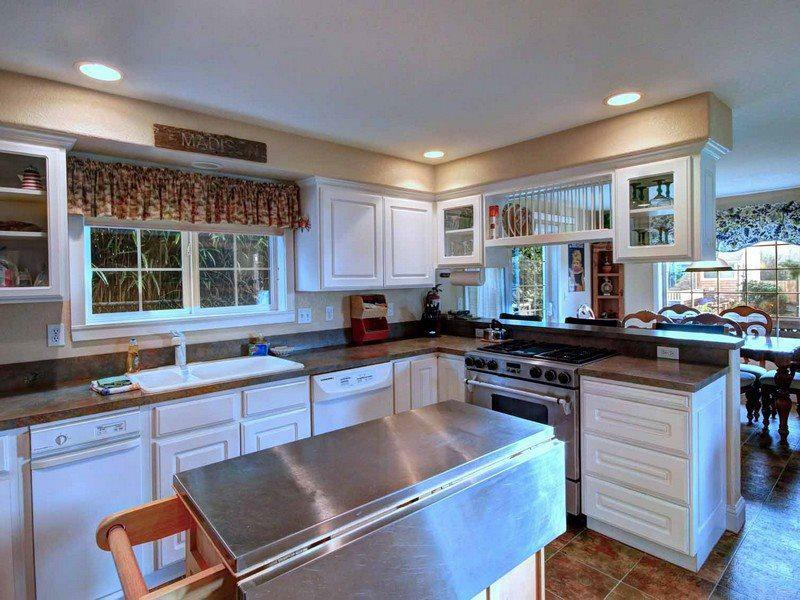 Off the living room is a large stocked kitchen with gas stove, bar and island, and nearby is an eye-catching formal dining area. 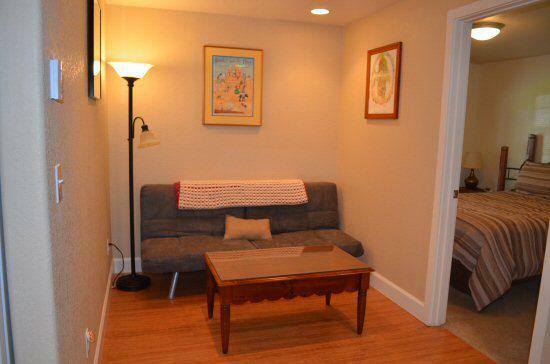 Off the kitchen, a small tucked away space with a sofa offers a quiet corner for unwinding should you need a vacation from your vacation. 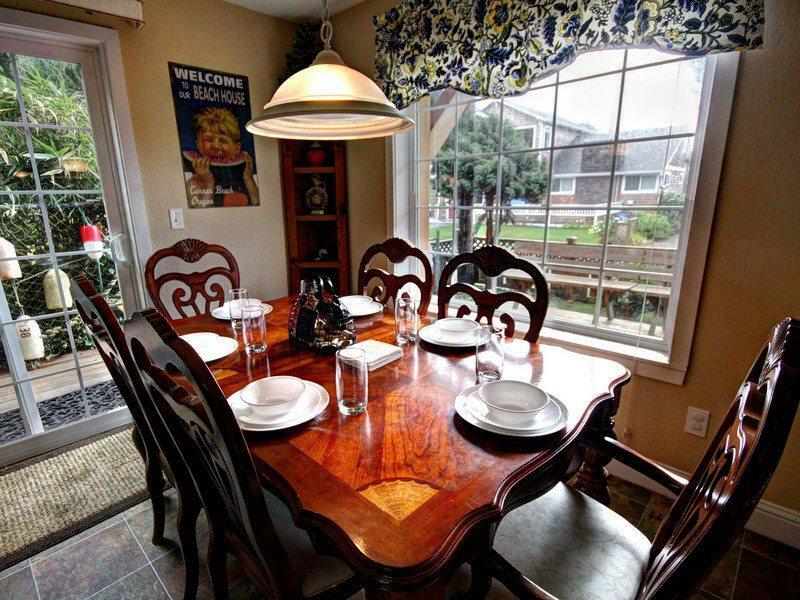 A sliding glass door leads to a generous deck featuring a fun brick stove and gas grill, ideal for an evening cookout. 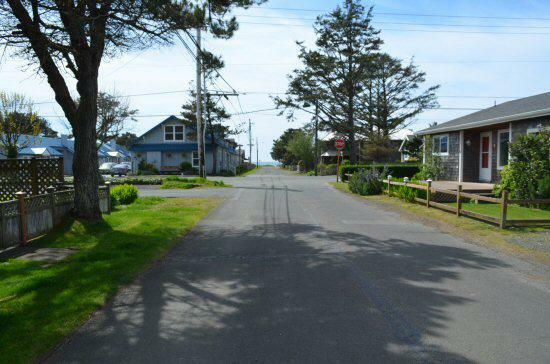 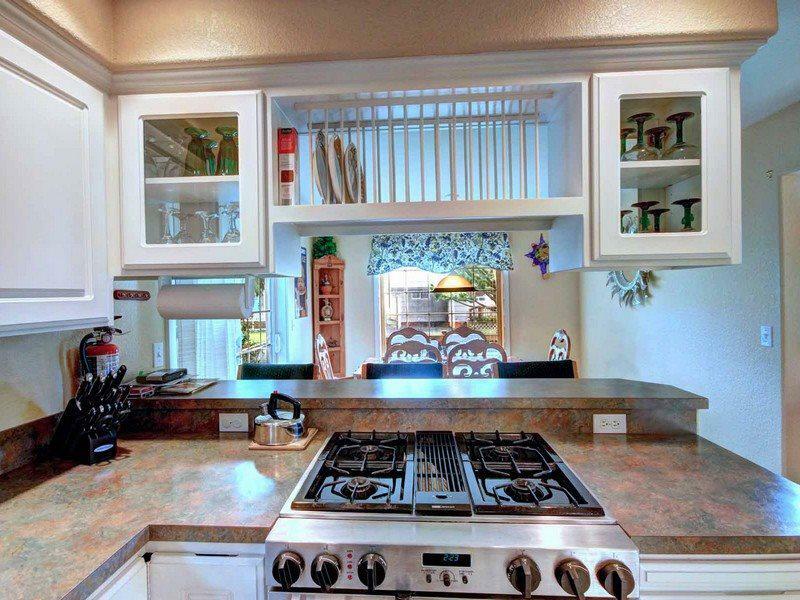 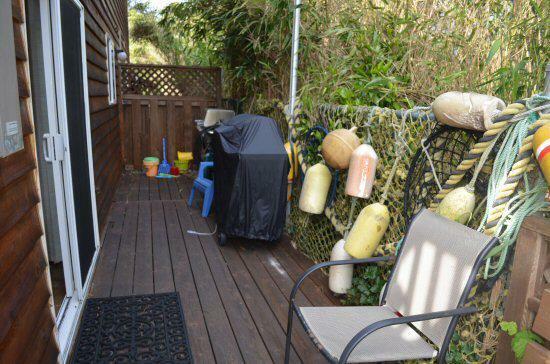 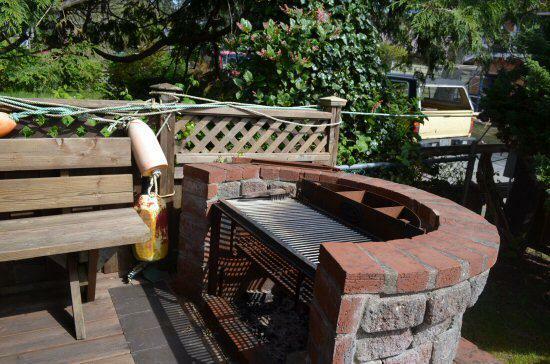 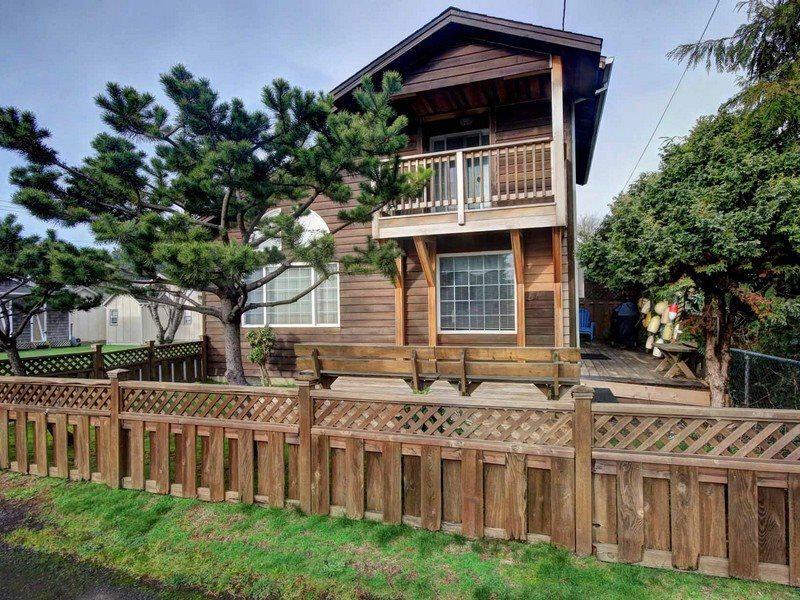 The home is surrounded by a sweet little fenced-in yard with peek-a-boo west-facing ocean views. 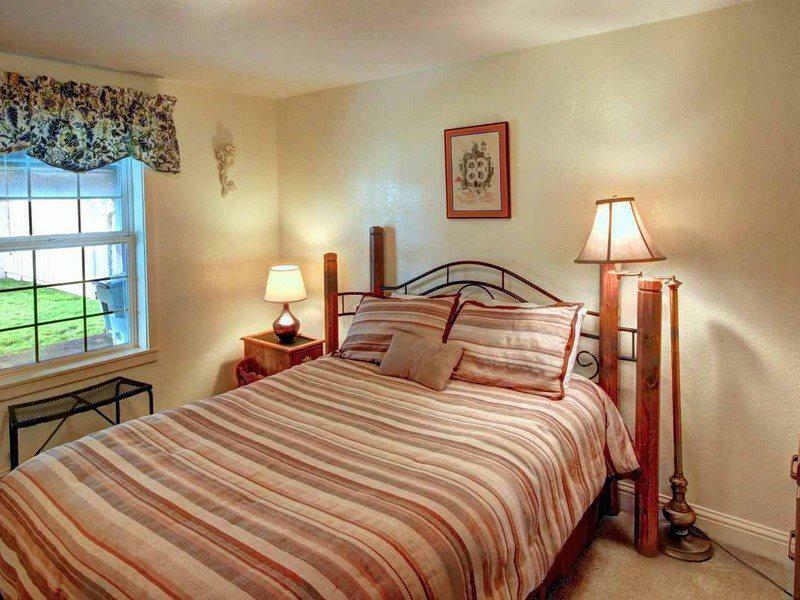 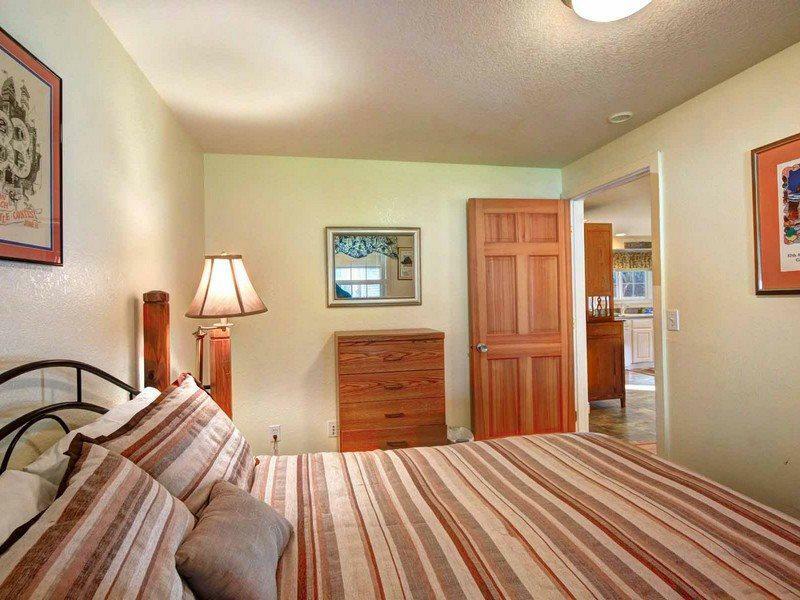 The clean, simple main floor bedroom is outfitted in earth tones and features a queen bed. 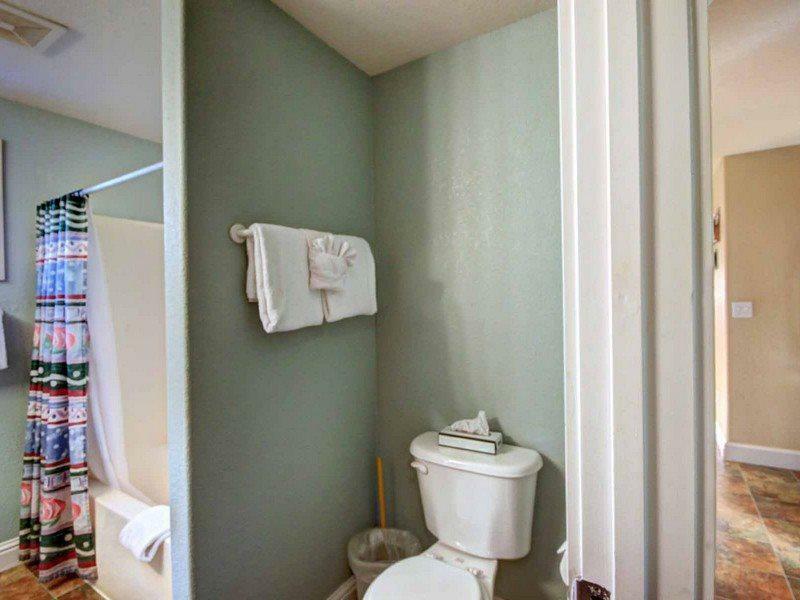 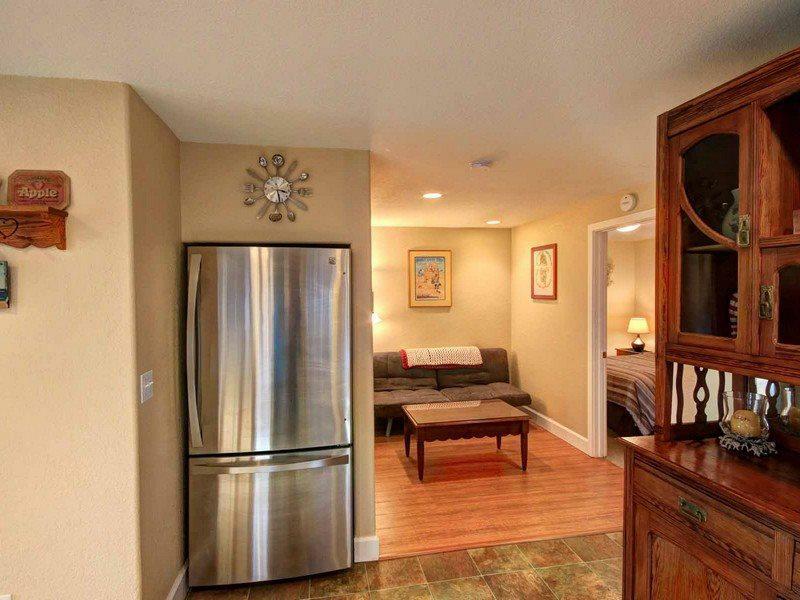 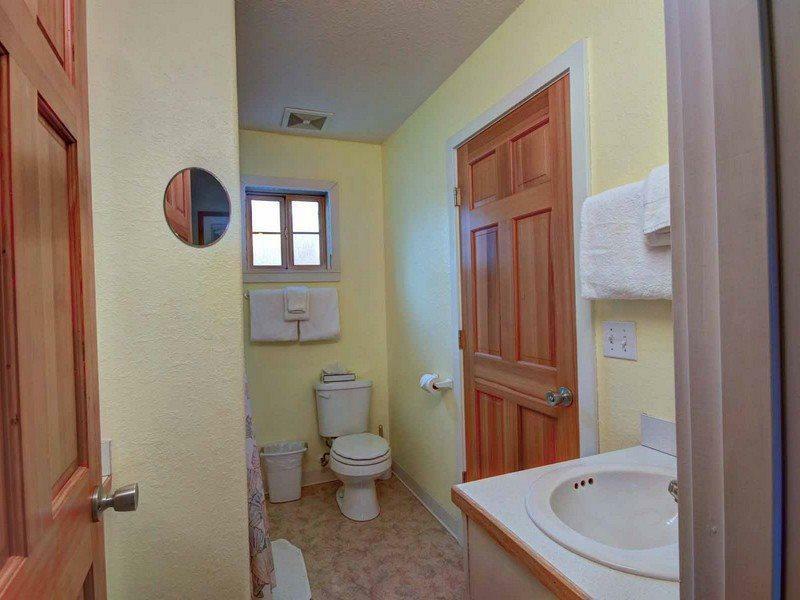 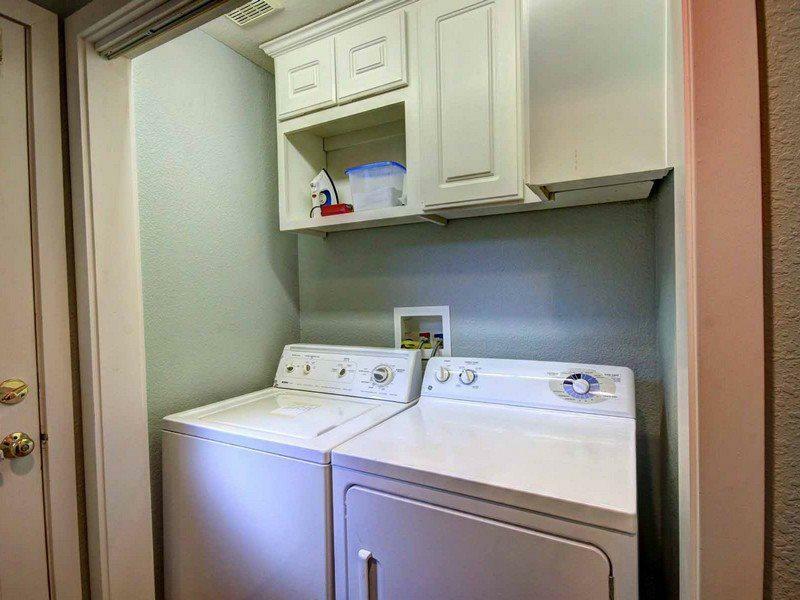 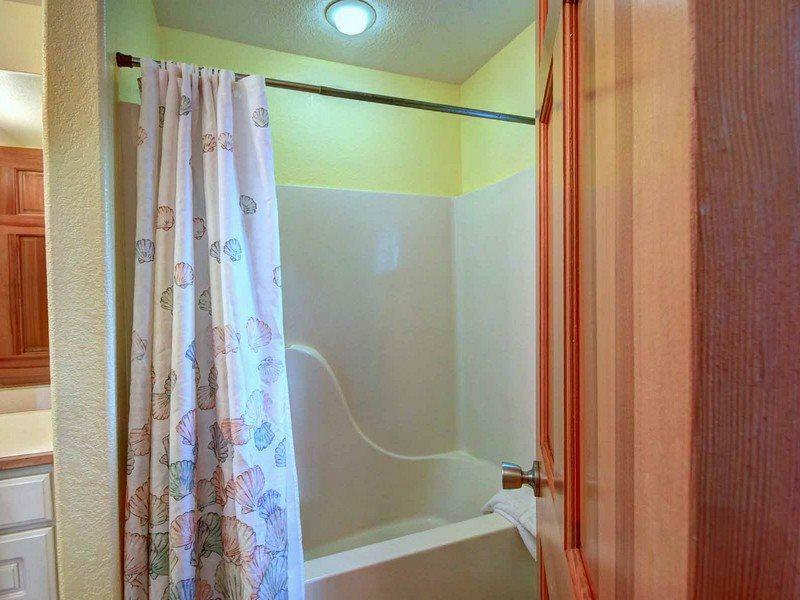 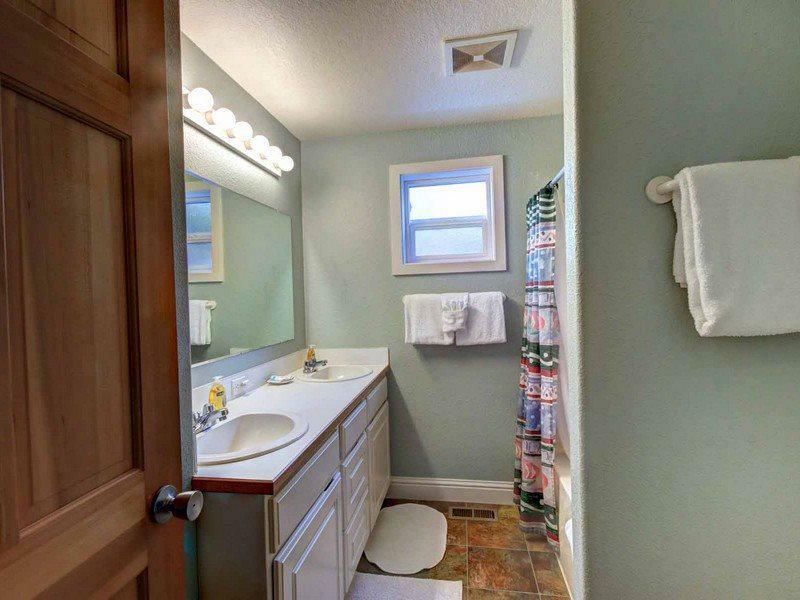 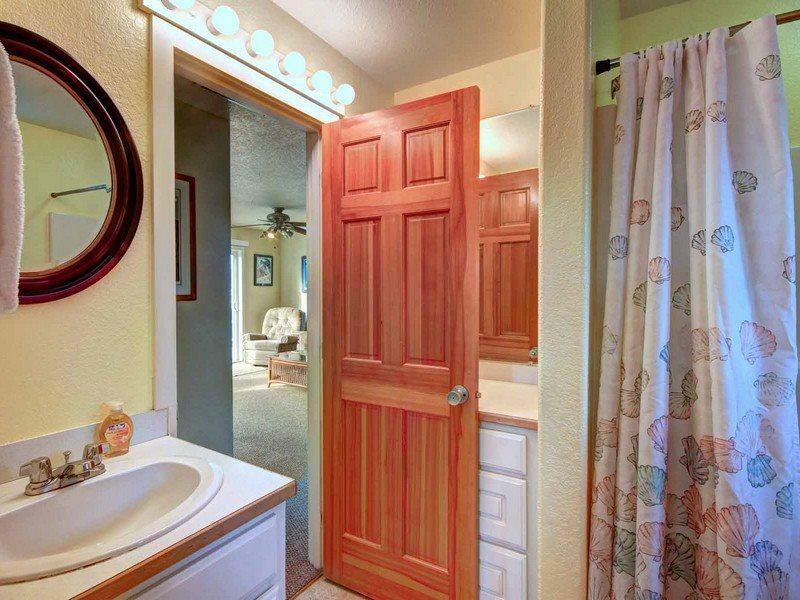 A white, bright nearby bathroom includes a double sink and tub, and there's also a washer/dryer available. 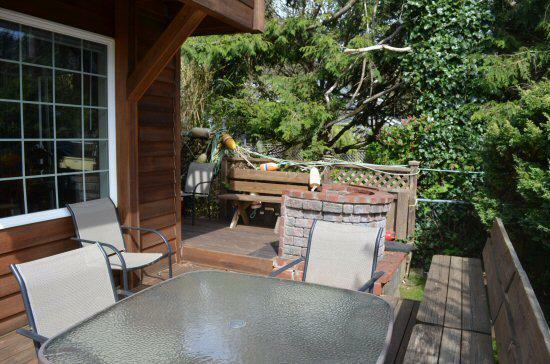 Out the back door, you'll have access to a small covered porch and stairs leading to the upper deck. 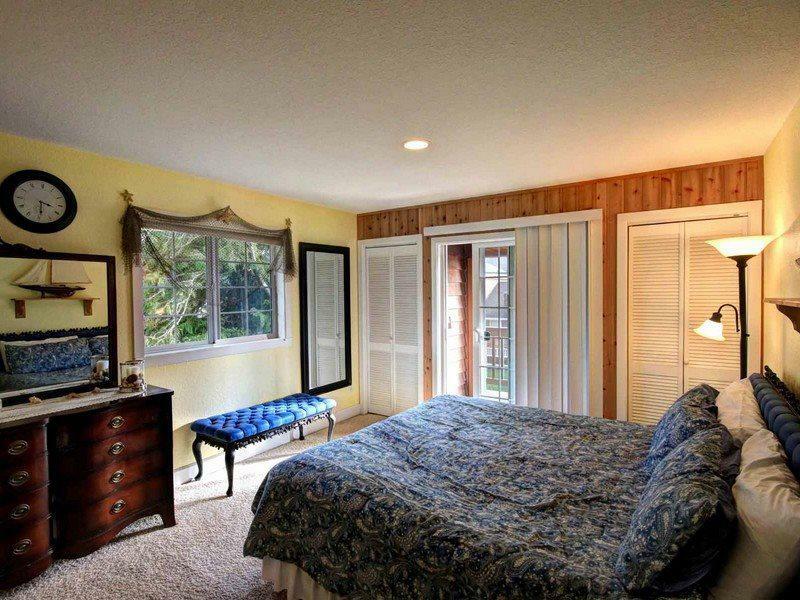 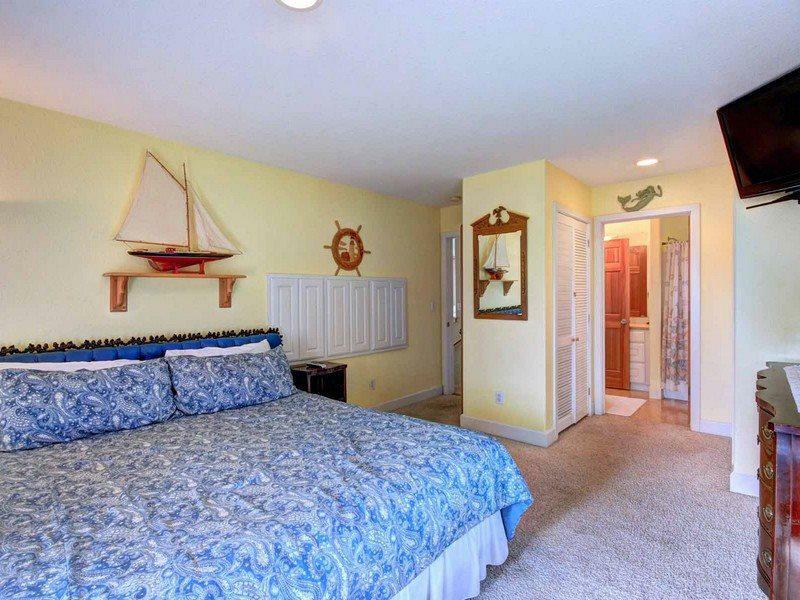 Upstairs, the master bedroom is outfitted in nautical décor and offers a king-sized bed, plus its own bathroom with tub. 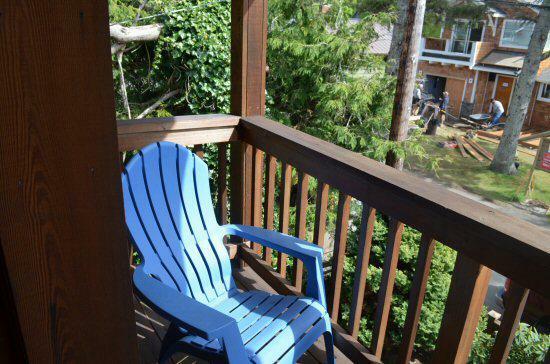 There's also access to yet another porch with a southern view of the trees out over the rooftops and just a peek of the ocean. 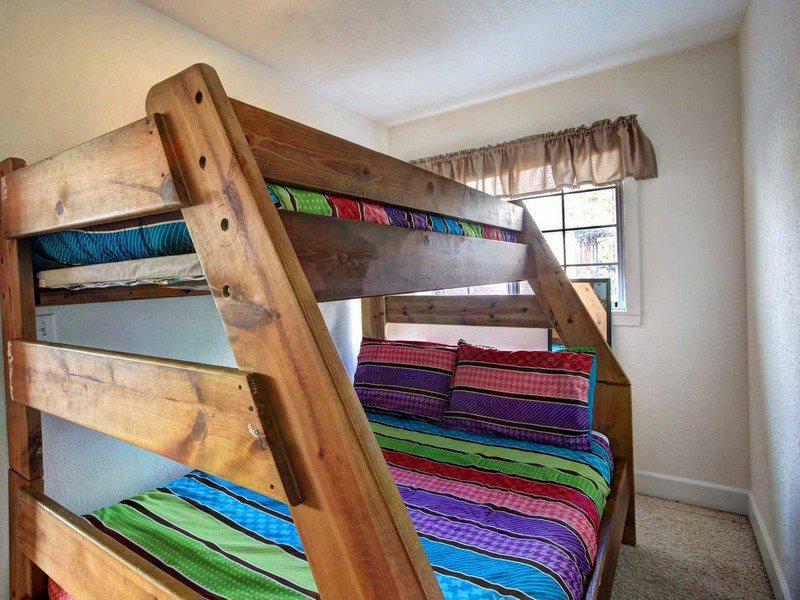 The second upstairs bedroom offers a pyramid bunk bed with double and twin mattresses. 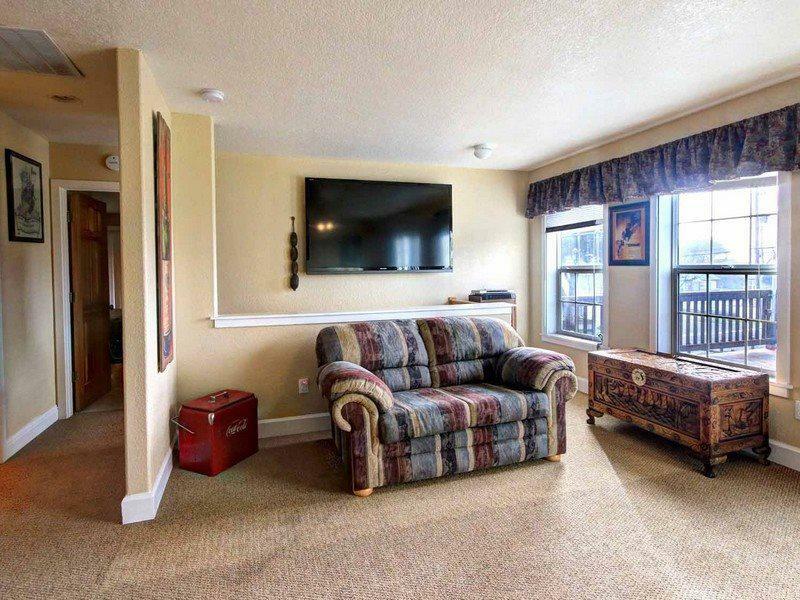 A cozily appointed second-floor den offers another huge flat-screen TV and opens onto the enormous west-facing porch, which is spacious enough to comfortably seat a crowd. 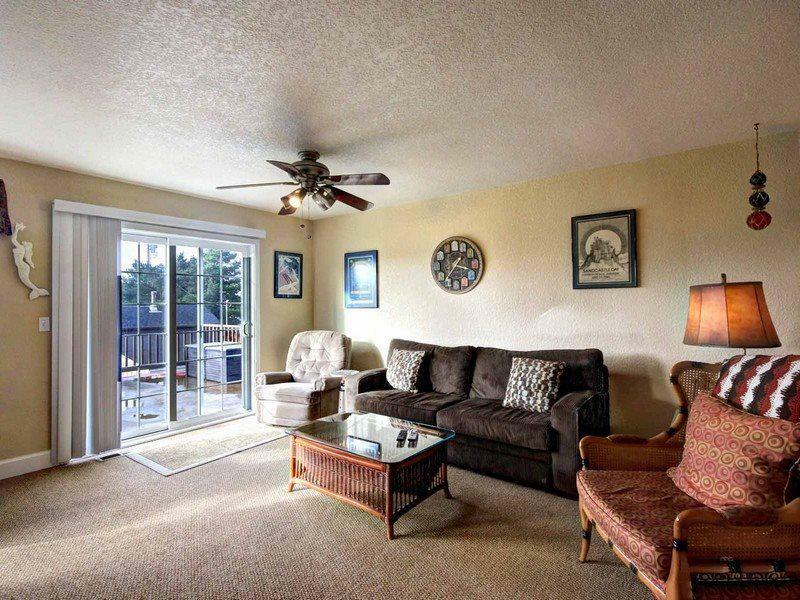 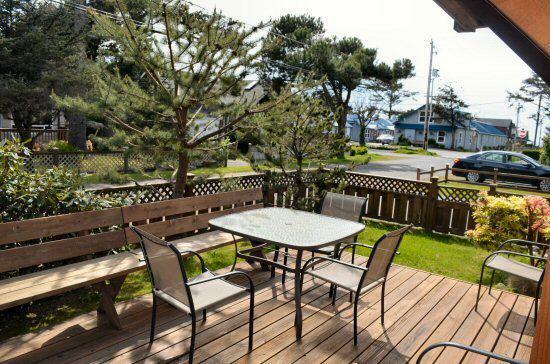 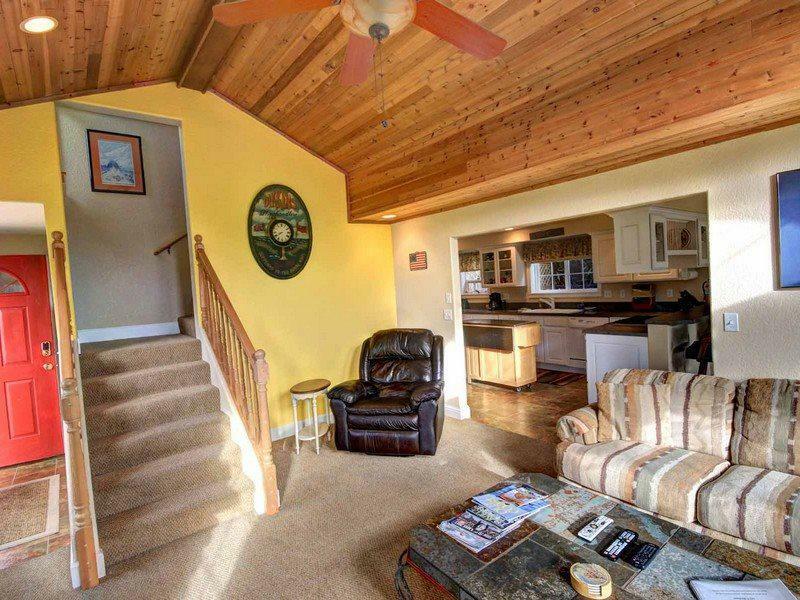 Featuring beautiful decorative touches, great outdoor spaces and easy access to both Downtown and Midtown Cannon Beach, Triple Deck is a sure bet for coastal family fun.